What Are You Working On? / Vad Har Du På Gång? Upon reaching its five year anniversary, the publication now exists as a gratis downloadable .pdf. What are you working on? / Vad har du på gång? / WAYWO was initiated by contemporary Swedish artists, Hanna Ljungh and Ulrika Sparre, in collaboration with curator and critic Jacquelyn Davis. The WAYWO publication serves as an additional component to their ongoing artistic project. 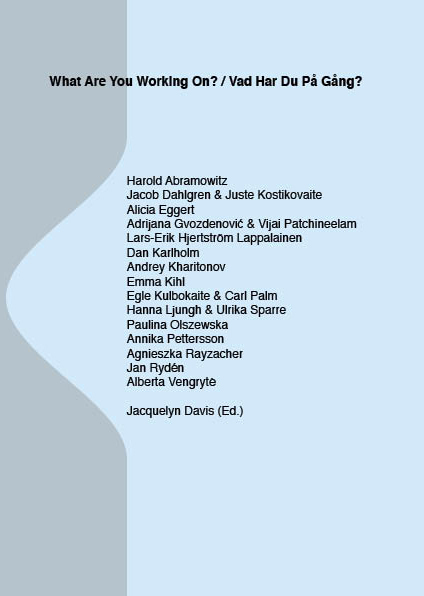 WAYWO participated in Art-Athina, Athens 2013 and during August-September 2013, an exhibition took place at Husby Konsthall in Stockholm’s suburb Husby—together with invited artist Zuzanna Janin and philosopher / writer Lars-Erik Hjertström Lappalainen. The exhibition itself and surrounding conversations prove to be complex, intricate and, at times, purposefully inconclusive to support the notion that unfixed, continuous thought in flux (and creative journeys supported by such) proves to be just as significant as singular points on the map—or any justified position worth defending. WAYWO asks: how do artists, critics, curators and researchers consider their relationship with eternity, infinity, continuity and the paradoxes existing in a world which primarily abides by these constraints, where many find themselves resembling slaves to unforgiving time demands? How does the realm of art relate and speak to text and literature? Both spheres explore the fictive, imaginary and boundless but use diverse methods and approaches—which frequently overlap and conflict. These uncharted spaces are approached utilizing various literary methods and genres: essay, fiction, experimental, short-shorts, exploded moments, fragmentary poetics, exploratory criticism, conversation, playful initiatives. This collection is a necessary puzzle piece ensuring the exhibition’s closure—to more aptly dissect and encompass its initial objective: there is obvious concern that the contemporary mindset stifles the way in which we view artistic and creative production—that individuals are thereby driven (or forced) by a consumerist society to produce, work and finish—even when there is not enough time, inclination or sincere inspiration. How do artists, curators, researchers and writers relieve themselves of the pressure of time, burden of production, representation of art as product or reducible object, artist (or writer) as mechanized, conditioned or predictable producer? Visit WAYWO for more information.